New research builds on an old lesson: To get people using transit, it’s all about timing. Whether you drive, bike, walk, or take the train, the way you get to work each day is more of an automatic response than it is a conscious choice. So long as other patterns in your life are constant, there’s no signal telling you to ditch your car in favor of the bus—even if you know it’s the cheaper, more environmentally friendly thing to do. To trigger changes in commute habits, studies have shown, a shift in context is key. For example, as CityLab has previously reported, workers are particularly open to changing up commute habits when their offices relocate—and they’ll stick with them, if their companies hit them up with the right incentives at the right moment. Now, research published in PLOS ONE in late April by Cardiff University researchers provides new evidence that changing residences can encourage a change in travel norms. But to make those new habits last, commuters may still need an extra push from policymakers. Using data from a multi-year survey by the Economic and Social Research Council on the daily lives of nearly 20,000 U.K. residents, the researchers measured how long it had been since residents had moved homes, their normal mode of travel to work, and the relative strength of their environmental attitudes. (The last metric was based on answers to such questions as, “I don’t believe my behavior and everyday lifestyle contribute to climate change,” and, “Any changes I make to help the environment need to fit in with my lifestyle.”) The researchers hypothesized that eco-minded folks would be more likely to choose environmentally friendly modes, such as trains and bikes, over cars. The results were these: The length of time that a person had lived at his or her current address was indeed linked to their commute mode—independent of age, gender, income, and geographic location. Specifically, a person’s chances of commuting by car were lowest immediately after moving to a different residence. Those chances sharply increased over the first two years in the new home, then rose slowly and gradually thereafter. 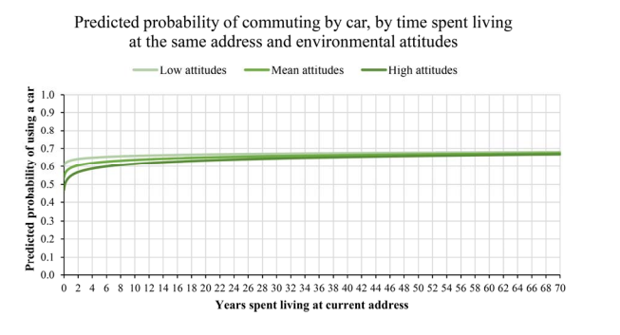 Eco-mindedness was indeed a predictor of lower car usage after a change in address. But, just as with everyone else, that link faded over time. That means that there may be a window of opportunity for policymakers who want to encourage the use of transit. When old routines are broken, “People may be more receptive to new information or support, which could encourage them to maintain healthy and sustainable travel mode choices,” Wouter Poortinga, a professor of social and environmental psychology at Cardiff University and one of the paper’s co-authors, said in a statement. Cities and businesses could target people who’ve recently moved to deliver information about their menu of transit options. The paper has a number of limitations, including the fact that travel routines are often composed of a mix of choices, and the survey that the researchers relied on only allowed respondents to choose one mode. Also, though the researchers did control for age as a factor in the relationship between time between home moves and commute modes, it may have played a bigger role than they accounted for. “People who regularly move homes may be likely to be younger people, who may be more inclined to act on environmental views,” the researchers write. 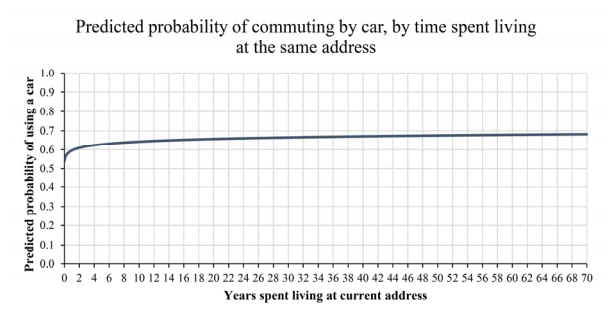 Likewise, older people (who are likely to have lived in the same place for a long period of time) may find the physical activity that transit requires too much of a challenge, and become dependent on cars. The relationship between commute choices, environmental beliefs, and motivations for behavior change is complex, and more research is surely needed. Even so, this paper builds on an important lesson about breaking old travel habits: Even the best transit options and incentives aren’t going to take people out of their cars by themselves. To lure people onto trains, buses, and bikes, it’s all about timing.